As part of Cadbury's Creme Egg Camp they have worked with Georgia Green of Georgia’s Cakes and launched some remarkably chocolatey Cadbury Creme Egg recipes. 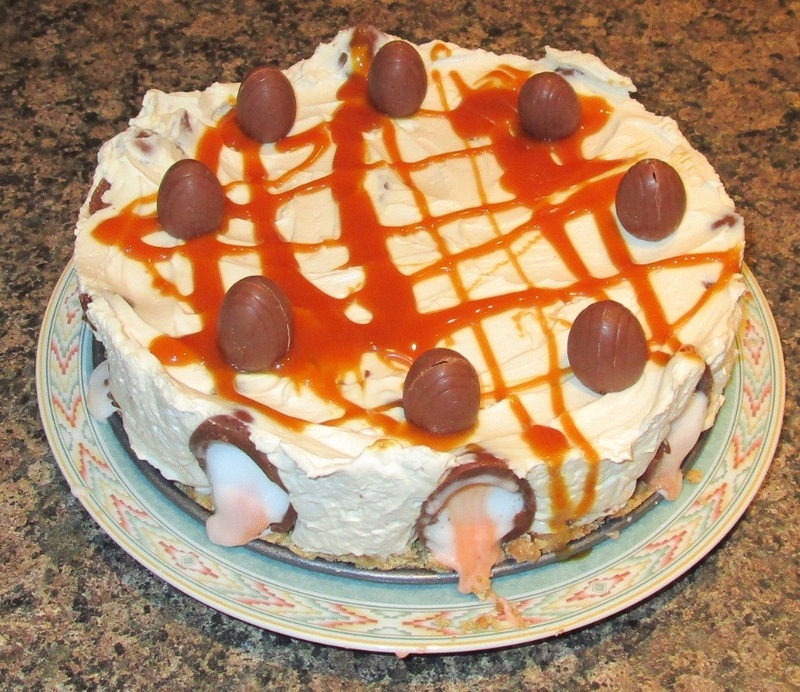 As it is Easter I picked a cheesecake to have a go at. 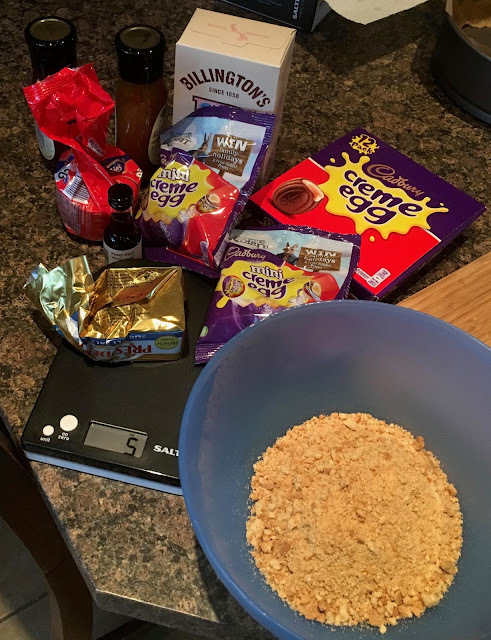 We started by collating all the ingredients; there were some serious numbers of Cadbury Creme Eggs involved, and I have to say chopping them was sticky business! 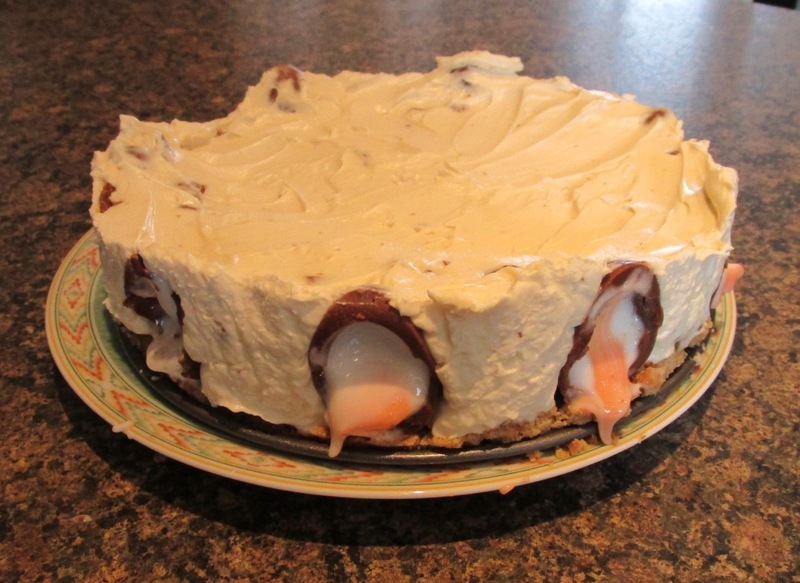 We mixed up the cream cheese with the icing sugar, added the chopped creme eggs, and whipped cream. There was a fun par of trying to stick halved Creme Eggs around the edges, which was also messy business! This looked okay when it had set though. 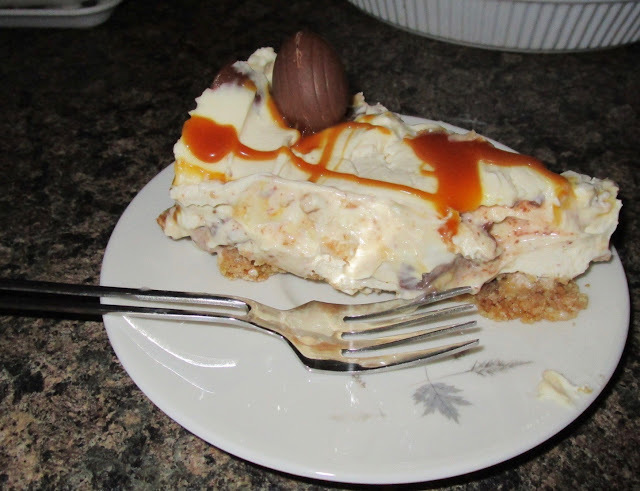 Finally we did the decorating, and as the caramel sauce went everywhere (it glugged out) we didn't get as far as the melted chocolate, but is still looked good. We love Lizi's cereals. Don't tell Mr. Kellog's's but Lizi is much better at it. 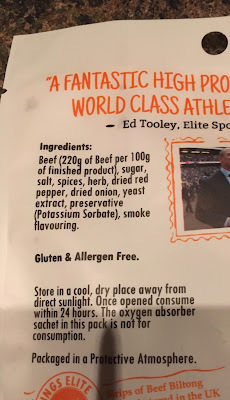 A good while ago I picked up this bag of high protein granola. 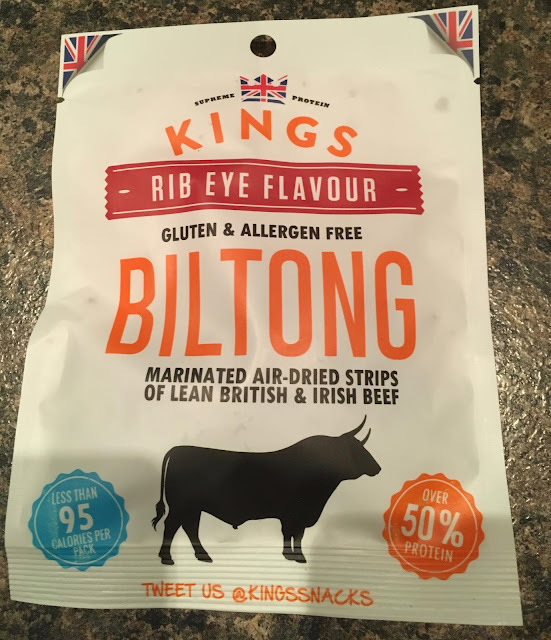 We've reviewed the 1000 hours brands high protein efforts so I figured I'd give it a go. 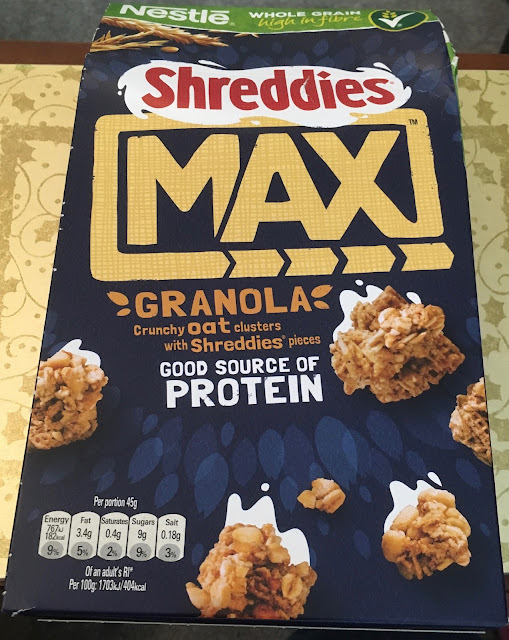 As you can see it's the usual amazingly high quality - actual recognisable things and really soft and squidgy granola to go with it. Essentially it's your typical Lizi's cereal with soya protein flakes added - but it works a treat. You can be all healthy and have this with almond milk and really taste the richness of all the flavours coming through. 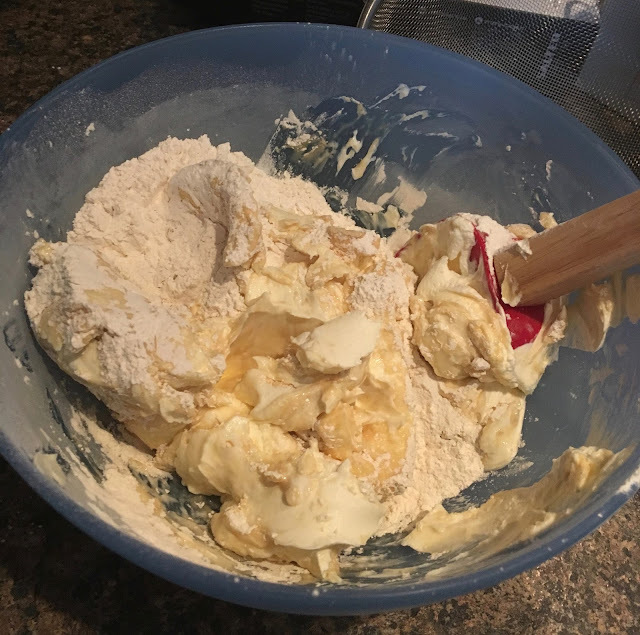 There are a mixture of textures in every bite! As usual I will be rationing myself and only having this at the weekends as a treat - back to the standard staples in the week - but boy is it something to look forwards to! Another massive hit. Happy Easter! It’s chocolate time! We have some slightly warmer (if not damper) weather on the way, so Cinabar bought these Limited Edition Cadbury’s Crème Egg Fun-filled Ice Creams to try. Produced for Cadbury’s Ice Cream Land these 100ml choc-ices on sticks have a runny Crème Egg filling. 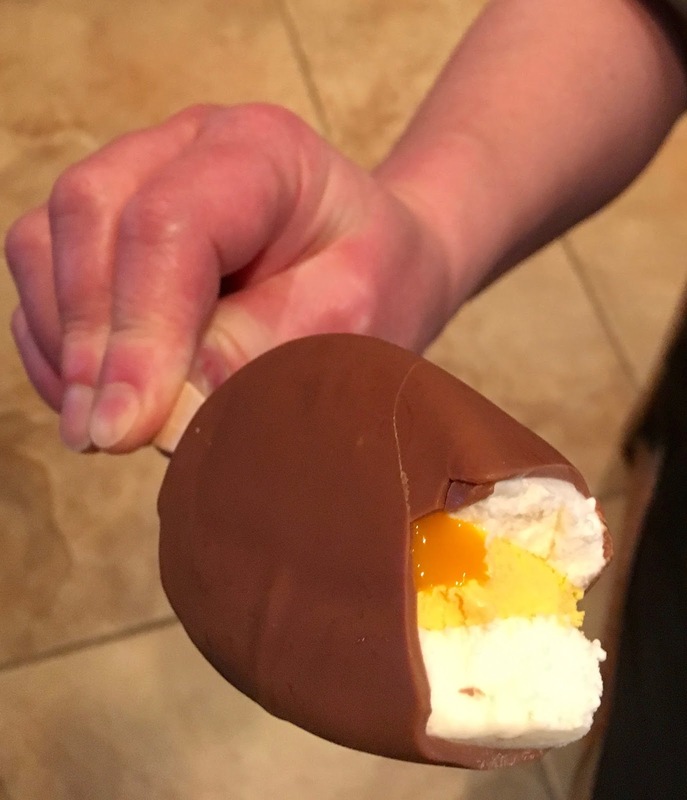 As you can see from the photograph below the soft ice cream centre has a runny yellow yoke. The usual Cadbury’s Milk Chocolate holds the ice cream well together throughout eating, unless you’re writing a blog at the same time and take too long to eat it. 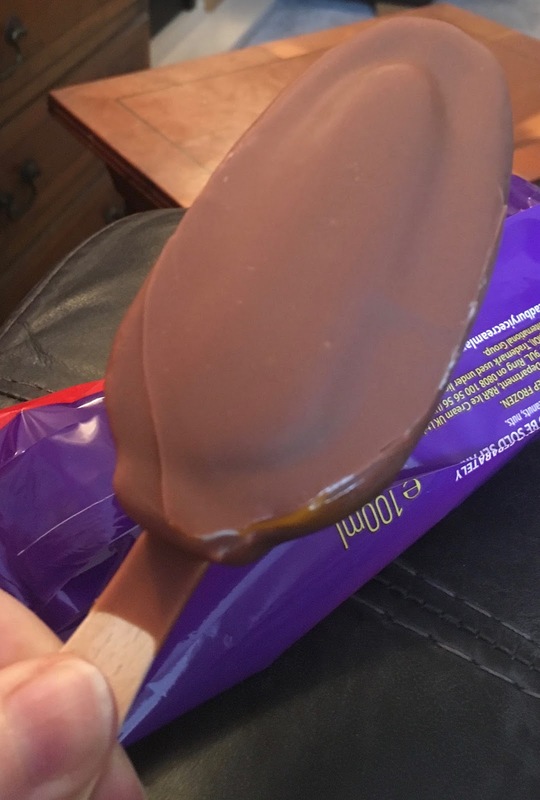 I found this to my cost when what was left of the chocolate top melted off and landed on the floor. I did have to spend some time trying to convince my brain there wasn’t actual egg on the floor whilst trying to mop it up! So they’re not particularly messy to eat, although I did get yoke in my chin whiskers at one point. 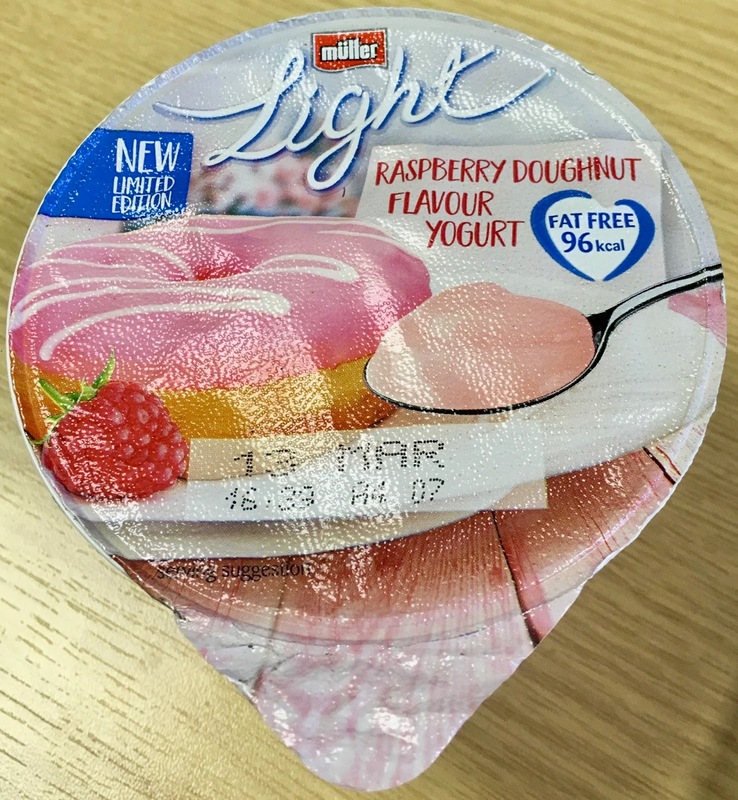 The ice cream and added yoke do taste like a cold creamy Cadbury’s Crème Egg. 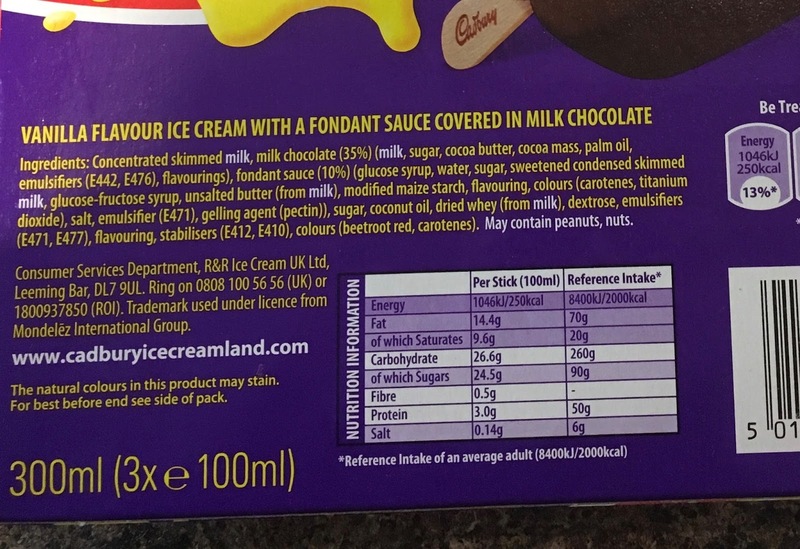 Although I will say one thing you have to expect is that the chocolate certainly isn’t as thick as a normal Crème Egg, so you get more ice cream Crème Egg than Cadbury’s Milk Chocolate. 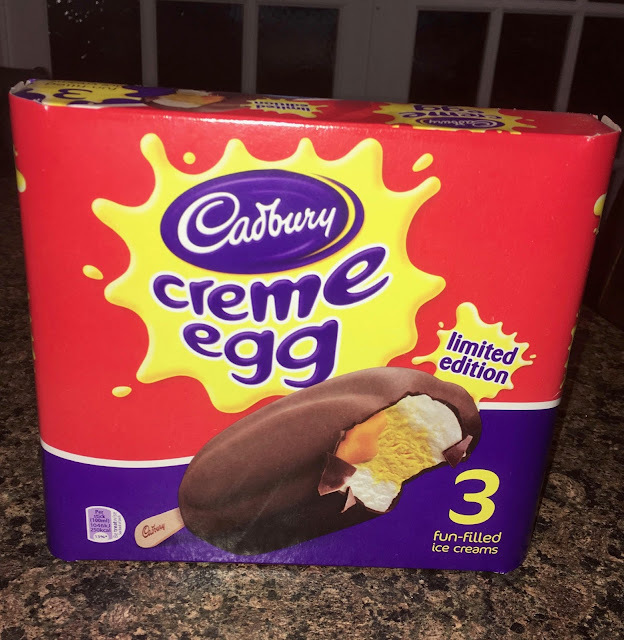 So if you like the centre eat these Cadbury’s Crème Egg Fun-filled Ice Creams, or if you like the chocolate eat the Cadbury’s Crème Eggs… How will you eat yours? Each 100ml ice cream has 250 calories, with 14.4g of fat, 24.5g of sugar and 0.14g of salt. See photograph for ingredients. It is that time again, when the lovely folk from Degusta Box send round a pack of goodies for unboxing. I always love the surprise element with their boxes, and couldn't wait to see what was tucked away inside. This month the box was quite heavy, which led me to think there might be a few drinks inside, and I was right about this. 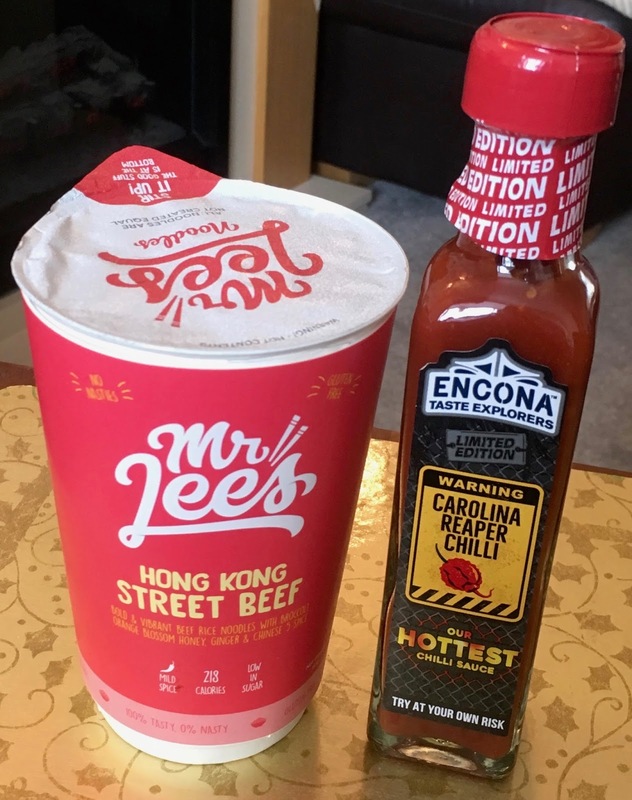 There were other goodies too, so first up I found Mr Lee's Hong Kong Street Beef. This is an instant noodle product, where you add hot water to get a simple noodle lunch. this could easily be spiced up with a splash of the new Encona Limited Edition Chilli Sauce. This is Encona's hottest sauce, and looks pretty scary. Not sure I'd be brave enough to eat it neat, but I'm sure it can spice up any number of sauces. As this is the Easter box, there are some sweet treats too. 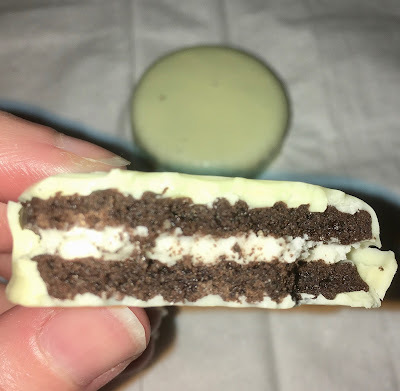 There are some Mini Eggs from Nestle, mixing the filling with either Smarties chocolate or Milkybar. 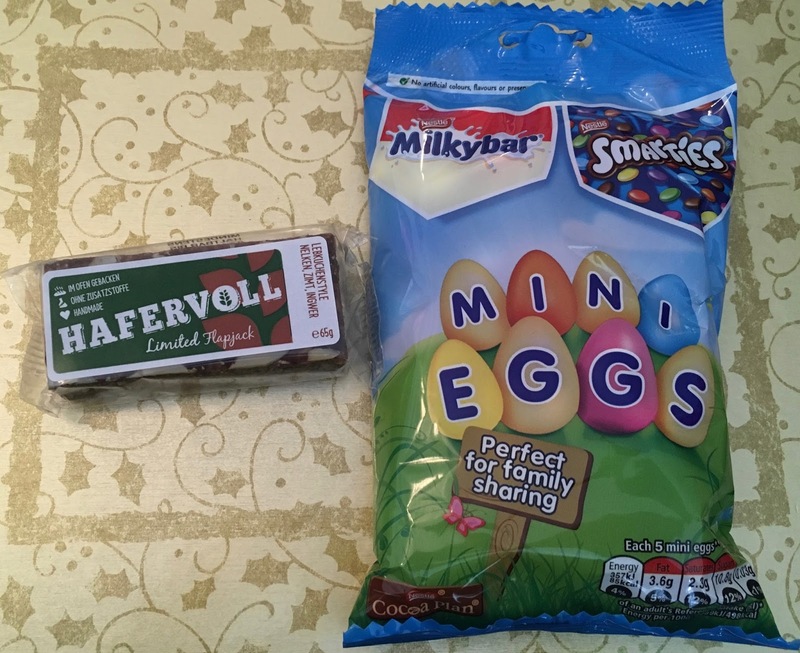 These eggs will not last long here at Foodstuff Finds, and will be excellent for munching on while watching an Easter film. There is also an interesting looking flapjack from Hapervoll, which is also a Limited Edition. It looks fun and spicy, and is flavoured with cinnamon and cloves, which are similar to Hot Cross bun flavours really. I'm always pleased when my Degusta box has something nice for breakfast, and this box is no disappointment. The box contains the new cereal from Shreddies; Max Granola. 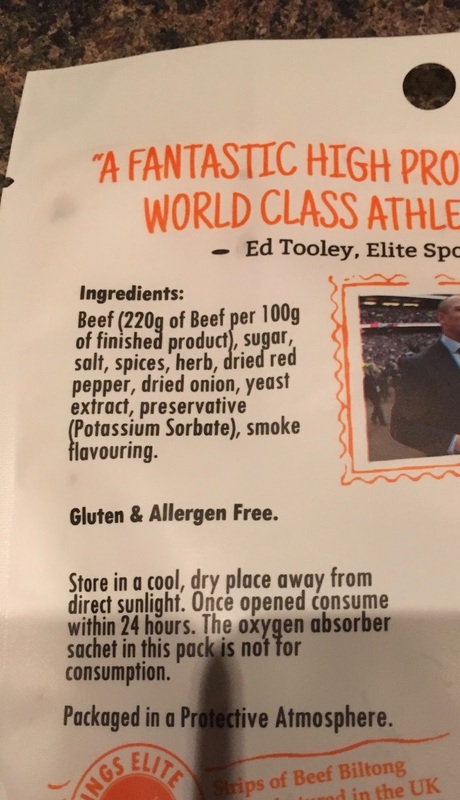 These are a good sauce of protein so very much on trend for foodies. Quite by lucky coincidence there was a jar of Cirio tomatoes. I'm making pasta sauce this week so this is a welcome addition in the box. It is made with 100% pure tomatoes, and I always find the Cirio products to be have particularly good flavour and a nice level of sweetness. 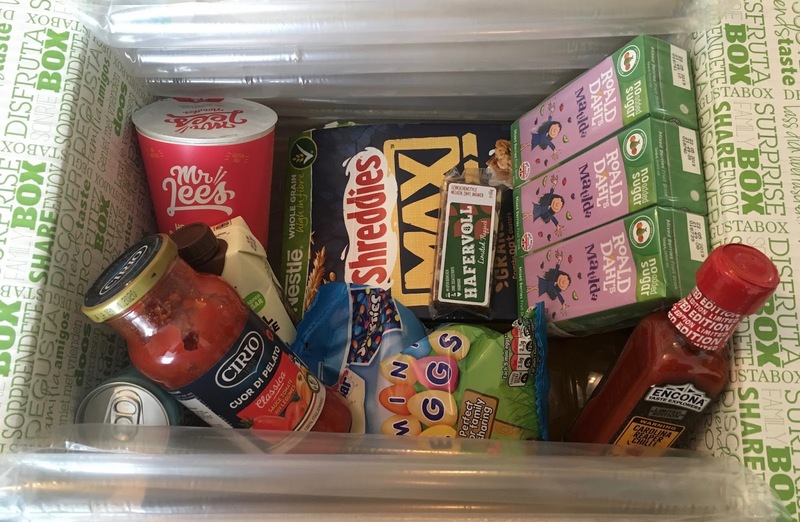 As predicted earlier there are quite a few drinks in this box, and they start with a couple of school ground favourites. We have a chocolate milkshake from the Canny company. 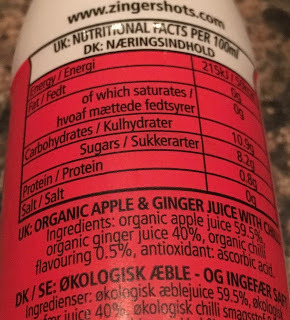 This is a nice twist on the drink though as it has no added sugar, and is all natural. There are also some fruit cartons, like the one I used to take in my lunch box to school. These are mixed berries flavour and the cartons are decorated with Roald Dahl's favourite Matilda. 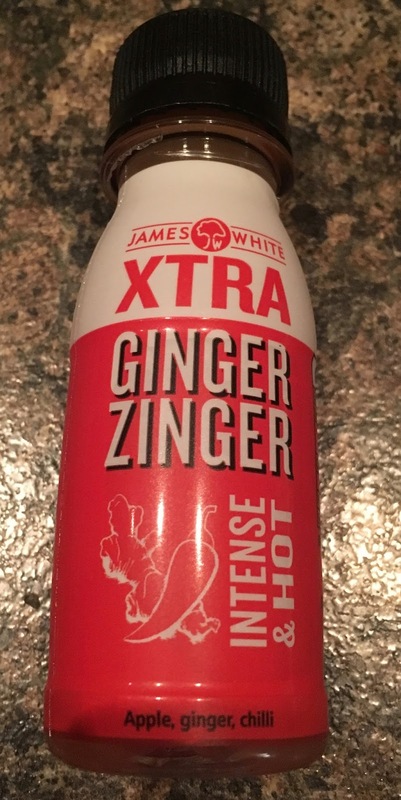 On a bit more of a grown up twist, there is also an energy drink. I'll be honest this is the sort of thing I'd normally pick up, but this one does look interesting. It is all natural and made by Tenzing, the caffeine even comes from green coffee beans. Last but by no means least is this fab bottle of Ribena, that I can't wait to try. It is flavoured with Pineapple and Passion Fruit, and I do love the tropical tastes. This will come in very handy over Easter and I can't wait to give it the taste test. I've really enjoyed this month box from Degusta, and I am looking forward to trying all the new products. My parents were given this bag of amusingly named FiggyPops by a friend who shops at CostCo - apparently they are in high demand and often they don't have any left. To me this is very similar to the Bounce energy snacks form Holland & Barrett so I wondered what the fuss was about to make these get imported especially from the USA. They have a lot of good things in them - indeed if they were native to this country the bag would have 5 a day all over it. It's mostly natural things (the ingredients list is mostly the word organic) and has avoided refined sugar too. I think that's pretty good for a compulsive snack food. They don't look like much, but they do pack a reasonable flavour punch for the size. For me though, I wasn't over keen. I'm more about the seeds and the coconut than the dried fruit. My Mother loves things like dried apricots so to her this is totally next level snacking. If you have a hankering for dried fruit and want something that is pretty darn luxurious then you should hunt these down. But if you are in the UK then I'm guessing it's CostCo or bust! Lagunitas Brewing Company believes it's the last Small Brewer in America to can their beer. 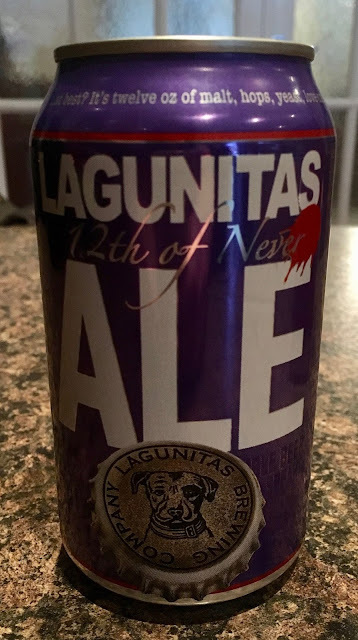 They describe this 12th of Never Ale as "twelve ounces of malt, hops, yeast, love and vibe in a solution of dihydrogen oxide captured in an alumin-yum wrapper…", which struck me as a play on a word that American's don't usually include the 'i' before the 'u' when pronouncing the word aluminium. In fact the word aluminum was changed to aluminium in the nineteenth century in this country, as scientists decided at the time is sounded more eloquent, however Americans didn't change it. I don't think Lagunitas Brewing Company are trying to start a revolution in how Aluminium is pronounced across the pond, I just think the play on the word "alumin-yum" just sounded fun. Reading the crazy fantasy blurb on the 355ml alu-whatever can and you can see that this brewing company doesn't take itself too seriously, which could be a lesson to us all. On opening the 5.5% volume ale there was certainly a decent hoppy smell mixed with a sweet barley malt. This fresh light golden pale ale glistens in the afternoon sun. On taste this is definitely a beer made with love and care. The spicy herbal hops tickle the palate first with the sweet malts following closely behind and into the aftertaste. Who cares how we pronounce it, because this beer is absolutely yum! 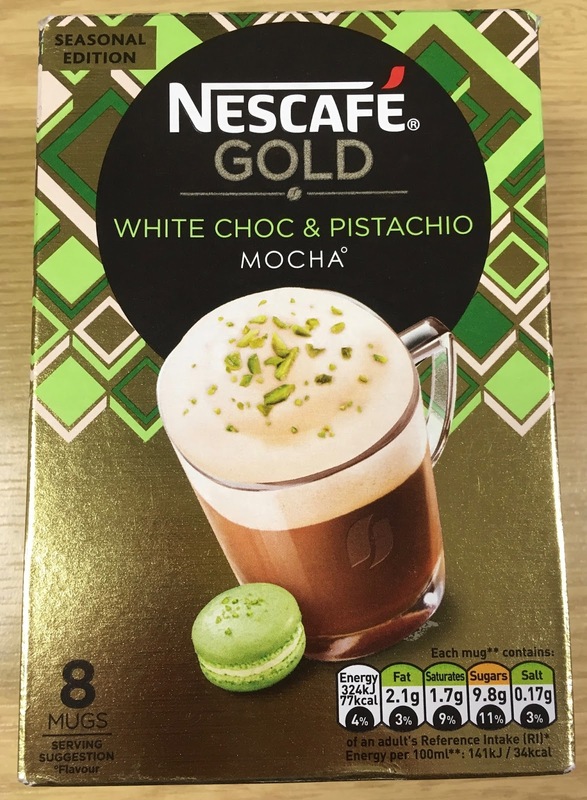 I found this by scanning the new products section on the Morrisons website, and then added them to my basket. 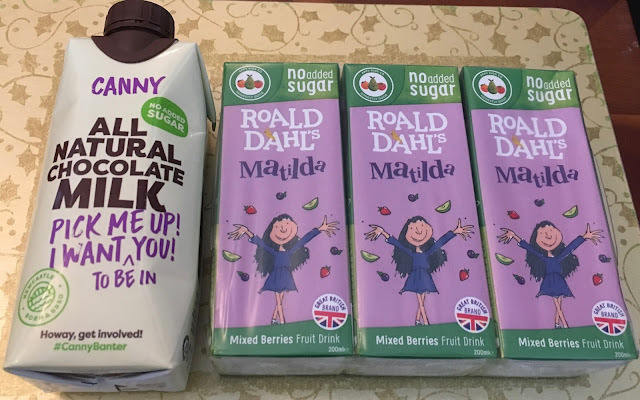 Anything new and chocolatey is a win for me, and I love Cadbury products. When the New Cadbury Cupcakes With Flake arrived the packaging made them look fairly generous in size, but when unpacked from their plastic box I realised they were actually quite a bit smaller than I thought they would be. 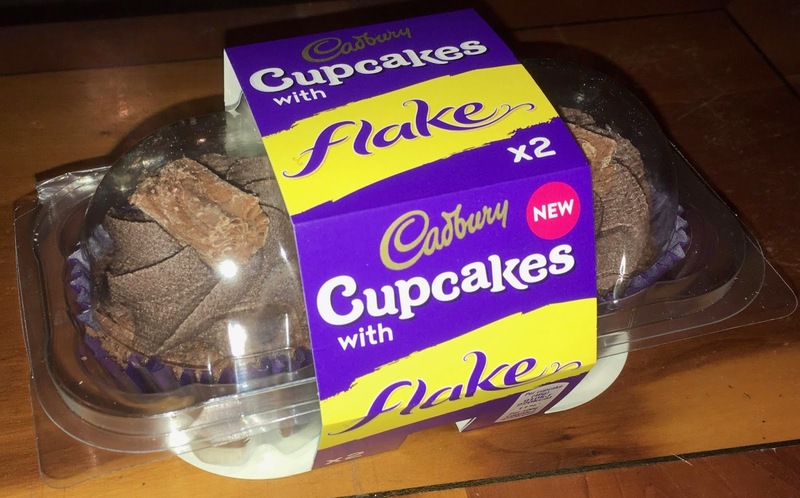 Inside the box were two cupcakes, in purple paper cases, topped with a chocolate frosting and of course a piece of Cadbury Flake chocolate. 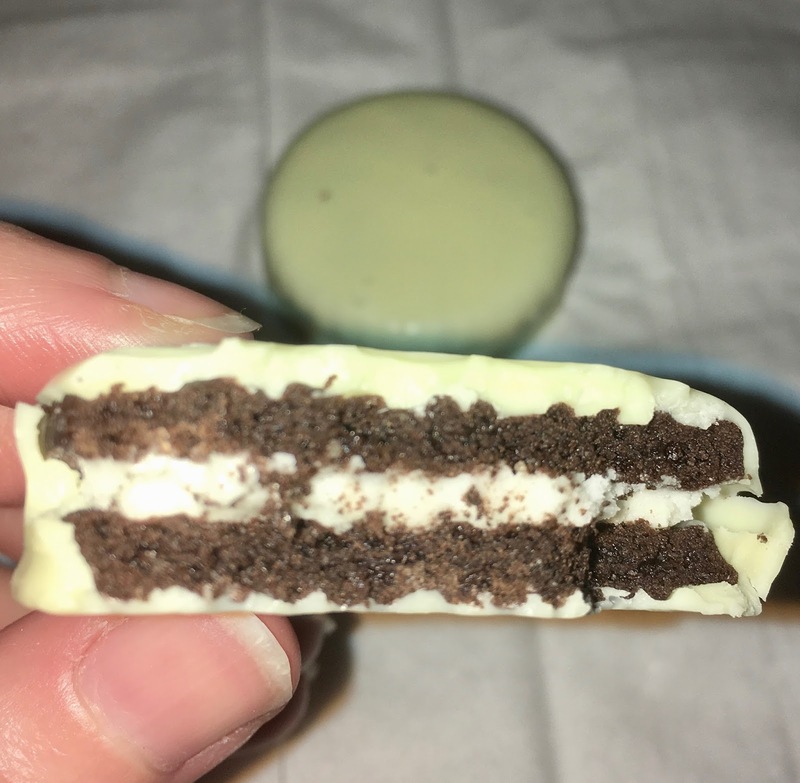 I gave one the the taste test and found them to be full of lovely chocolate flavour. 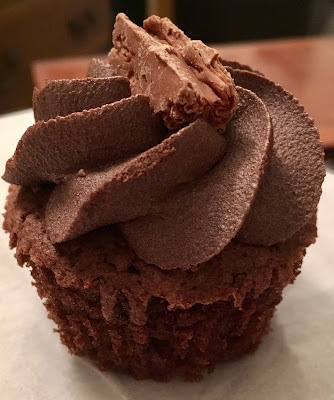 The sponge was fluffy, sweet and rich, and the fondant icing was sugary with a good cocoa base. The Cadbury Flake was a nice touch, but that was where the theming with Cadbury ended. 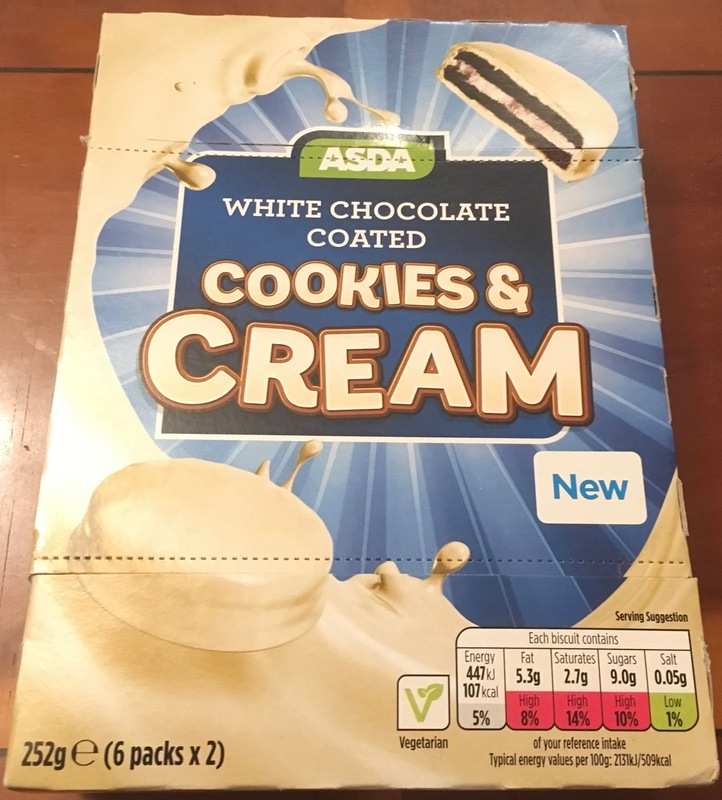 The chocolate flavour in the sponge and the icing was tasty, but it was quite a generic flavour, and not particularly that of Flake, which I always think is quite distinctive, it isn’t quite the same flavour of Dairy Milk. So the cupcakes are nice, and a good chocolate treat, but apart from the the Flake topping, they aren’t themed that strongly. We went to see the Harry Potter play in London. No spoilers here - but it is very good. Seeing it over two days meant we got to eat at lots of lovely places which is the goal of any trip really, isn't it! The locals had even got in on the act with Potter/Star Wars themed coffee available. Not interested though. What I needed was chicken! I had the Chicken Strips - I only learned afterwards that I should have added the nice fries too. Oh well. Mother Clucker is one of those semi-street food things where you have a van that can pop up anywhere. Here it's down Brick Lane by Rough Trade East. And it's pretty good. The chicken is tender and fresh, the coating is thick and almost like an apple crumble topping (thanks Kate!) but in a KFC style with all the usual herbs and spices but a lot more quality. I'd make a special trip over just to eat this again. Here in Spittalfields Market I found a Chinese Tea shop (Yi Yang? I forgot to get the name!) and picked up a lovely strong herbal Lemon tea. I had medium sugar and not heated, which I think was a mistake in the Mini-Beast Arctic winds. I enjoyed it though. I got told off by coffee drinkers for drinking it too slowly, but these herbal teas are meant to be sipped and enjoyed. Everyone else seemed to be going for some kind of milky bubble tea, maybe I missed out. We had a great time wandering around hipsterville and catching up with old friends. Have to do it again soon! Last week I blogged about Vintage Fine Ale, the first of two limited edition Greene King beers that have been made with the near extinct Chevallier malt from their secret (or maybe not) seed bank. Chevallier malted barley hasn't been used much in the last century and once the three fields of this rare malt have been all used up, it could be quite sometime before anyone tastes Chevallier in a beer again. This Suffolk Pale Ale is the second beer. Saaz hops and Strisselsplat hops were added in the brewing to create a mixture of floral, citrus, herbal and spicy bitterness to this pale ale. On opening the 568ml bottle there was a spicy herbal hoppish smell mixed with the sweet malt. On taste this 5% volume ale had the now familiar sweet taste of the Chevallier malt to start with which again complemented the bitter flavours of the hops. There is spicy warmth here from the initial flavours mixed with the herbal and the floral hops and with a touch of citrus into the sweet malt aftertaste. This is a complex pale ale, full of all the flavours of hops and the luxurious sweetness of Chevallier. I can see why Greene King wanted to roll back the years to produce both these beers. It would be grand if they could create more fields of this Chevallier malted barley, as I'm sure these would become very popular beers without being limited editions. I bought this from the shop opposite my parents house which had a selection of little prize pods, all about £1. I decided to be rational and to only buy one - reasoning that they were probably all the same and not worth the time or money. As usual the effort has been all put into the packaging - a staple of the Disappointment Wars series. But here we have actual moulded Marvel logo, maybe official, maybe not. And here we have the non edible contents. All surprisingly competent. You get three things - a sticker of most friendly Spider-Man (surely Friendly Neighbourhood is the slogan), a round spider disk and a stand up spider thing. Here they are in close up - the spider disk is a bookmark too - and it’s number 46 so you’d have to spend £50 to get the set. Hmmmm. You only get three sweets which is a shock, but they are nice which is a bigger shock! I ate all three. Never in the history of Dissapointment Wars has the food actually been eaten! This didn’t then get included dismissively with other tat - the Spider-Man barrel is the real deal. Sure it’s not worth £1 but if you have a young person who likes Marvel and isn’t too fussed about having useful things that actually relate to the brand then this is ok.